Greetings, everyone! “G,” here, filling in for Lea to write a glowing review of Greensquare Tavern, a very Paleo-friendly, “farm to table” restaurant in New York City. 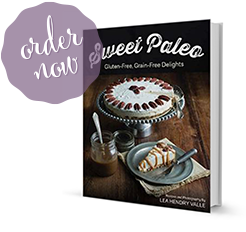 Lea and I really enjoy dining out – probably too much, if my wallet has anything to say about it – but her celiac disease adds an extra dimension of difficulty to finding a suitable restaurant. On more than a few occasions we’ve found great restaurants unfortunately using ingredients that make it virtually impossible to dine safely, so we have been forced to cross them off our list. Therefore, it was a genuine pleasure to come across the Greensquare Tavern. 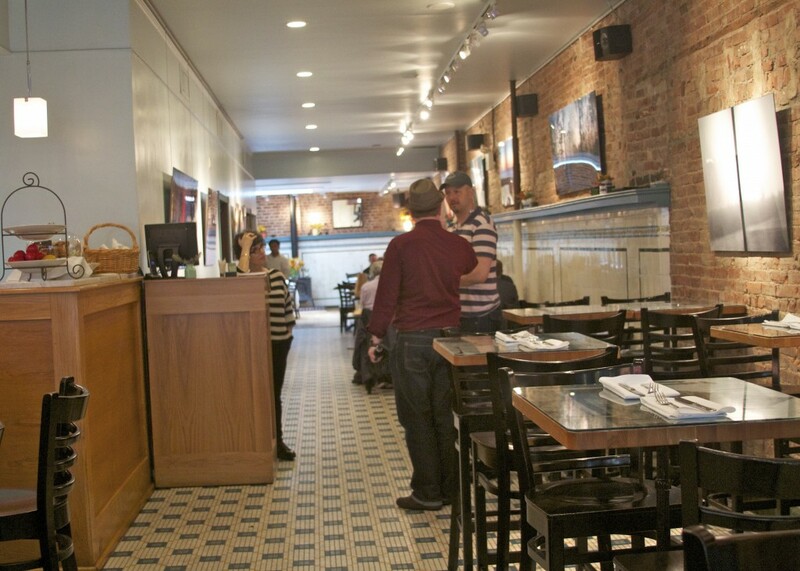 Located at 5 West 21st Street in Manhattan’s Flatiron District, Greensquare Tavern is spacious, airy, and inviting. A picture window in the front by the bar and a large, overhead skylight flood the dining area with soft, bright light even on a gray rainy day like the day of our visit. We arrived just before the lunch rush and were greeted by Renee Typaldos, one of the managing partners. There were still plenty of seats, but that didn’t last long. Within 10 minutes, most of the tables were full of hungry office workers and assorted cube mice looking for a healthy, delicious lunch. 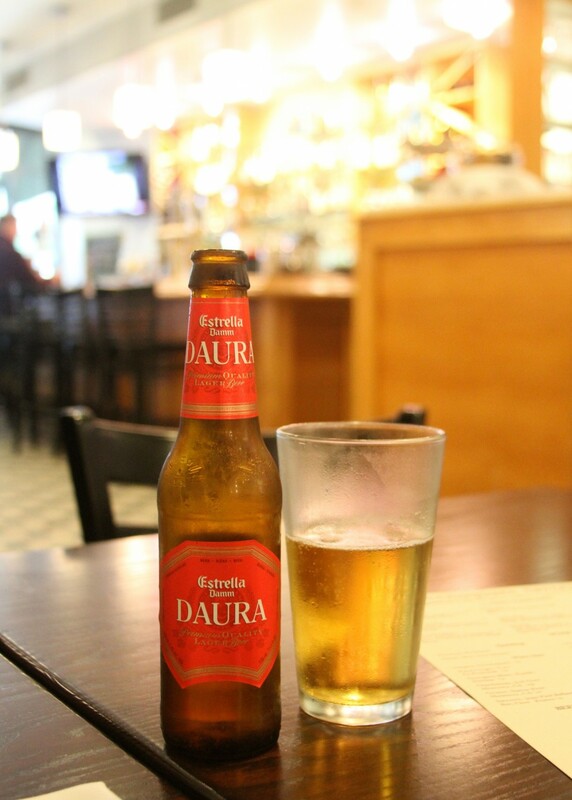 I started off as I usually do, by checking the beer list, and was pleased to inform Lea that Estrella Damm DAURA, a gluten-free ale from Spain, was available! She clapped her hands with delight and promptly ordered one in a large, frosty glass. 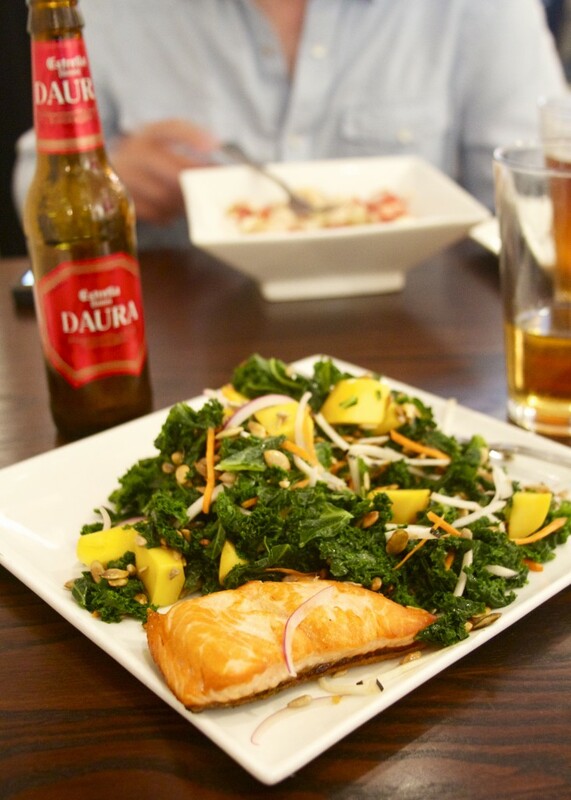 There aren’t many gluten-free beers, and seemingly fewer restaurants that serve them, so a nice, tasty bottle of DAURA was an unexpected treat. After delivering the gluten-free beer, our waiter returned to tell us about the daily specials. 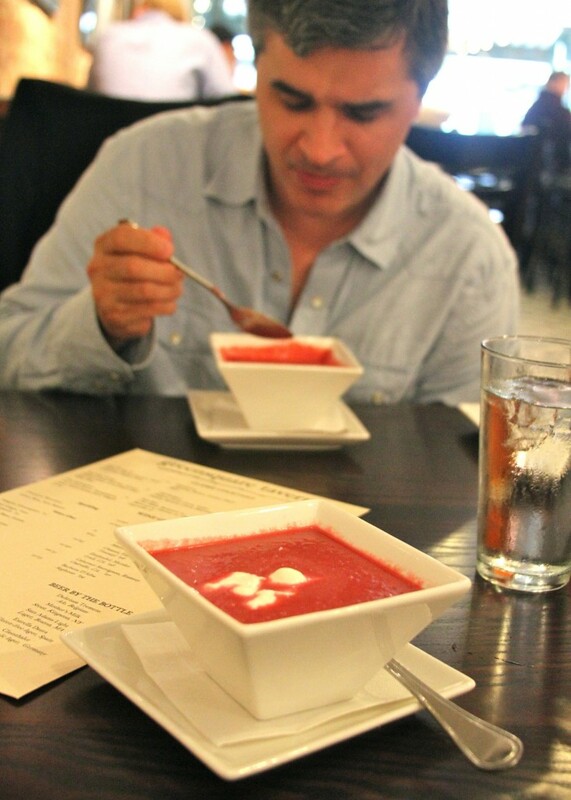 Lea and I both started off with the Chilled Beet Soup. The soup was earthy, fresh, and smooth but with just the right amount of texture. We ordered a “cup” size but it was definitely a generous portion. 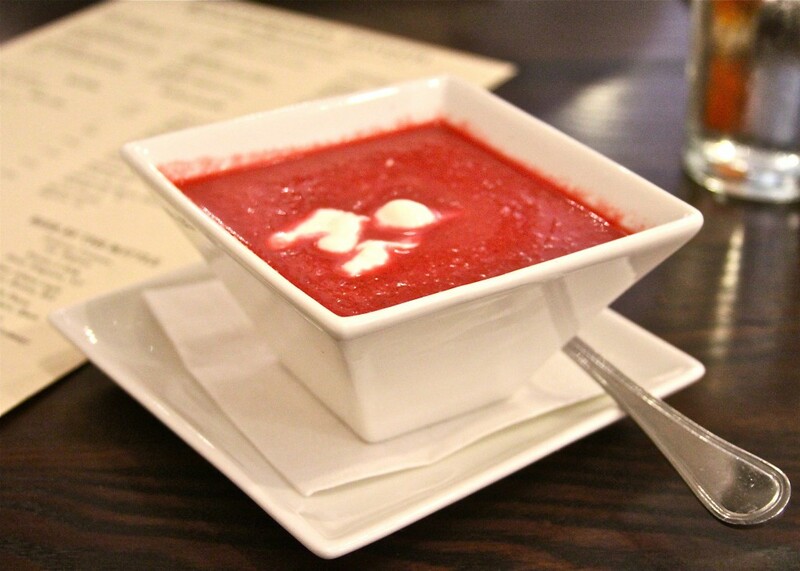 Our waiter impressed Lea greatly with his understanding of the Paleo diet by double-checking if she wanted her soup with or without the dollop of sour cream. She ordinarily avoids dairy but in this case made an exception. For my main course, I selected the Greek Salad with grilled chicken, and Lea had a Spring Kale Salad with grilled salmon. 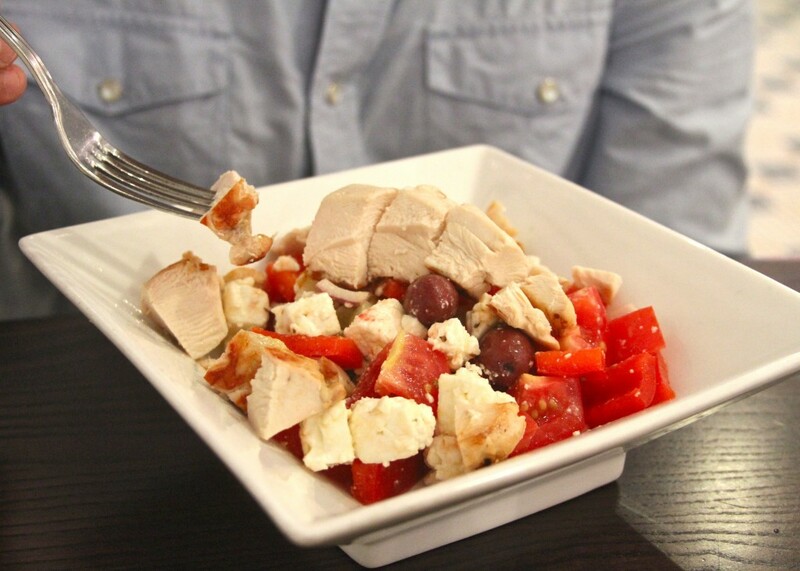 As you can see from the photo, the Greek salad was made with a traditional recipe, meaning no green leafy vegetables, and contained ample chunks of moist, boneless chicken. It was delicious. Lea thoroughly enjoyed her kale salad, too. 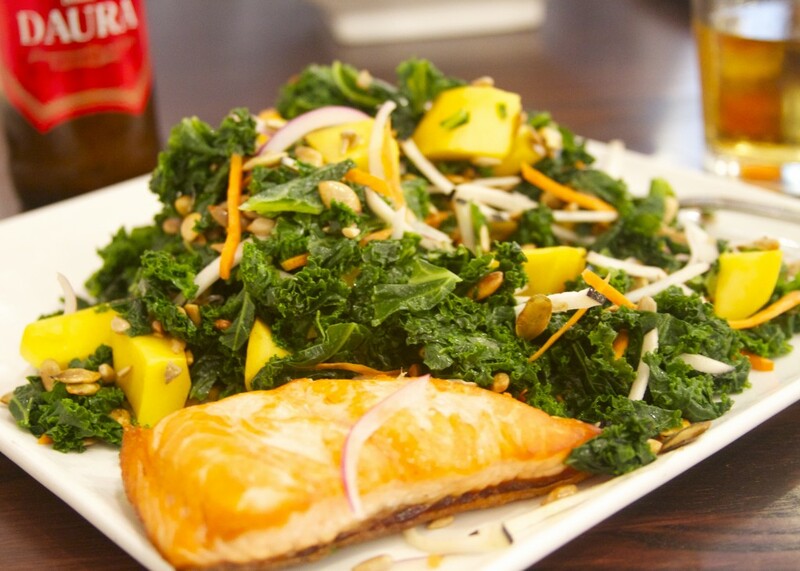 The deep green, blanched kale was combined with a unique mix of sunflower seeds, pumpkin seeds, juicy chunks of mango, and Julienne vegetables. The light citrus vinaigrette rounded out the ample-sized dish. Lea said the flavor of the vegetables was bold and the freshness was prominent. The perfectly cooked salmon was moist and tasty. Overall, two thumbs up for our entree salads. And here’s where I learned – or rather, relearned – my lesson for the day. I ordered a slice of the Carrot Cake, knowing full well that it was full of gluten and definitely not Paleo. But “Lunchtime Gav” was not in the mood for dietary concerns – he just wanted some tasty cake. And he got what he wanted, too! 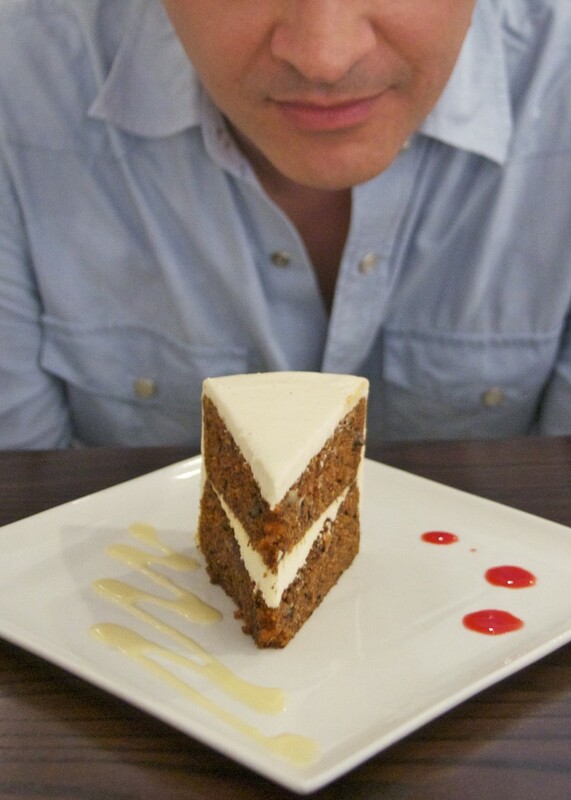 The Carrot Cake was excellent; moist but not soggy, perfectly sweet, and generously sized. Unfortunately, “Lunchtime Gav” is an impulsive guy. “Drive-Home Gav,” groggy from the insulin overload, cursed “Lunchtime Gav” for his lack of self-control. But he didn’t stay mad for long, as “Naptime Gav” took over for two hours after the 45 minute ride home from Manhattan. Lea, ever mindful of her celiac disease, fared far better than I did by ordering the Greensquare Tavern’s Flourless Chocolate Cake. 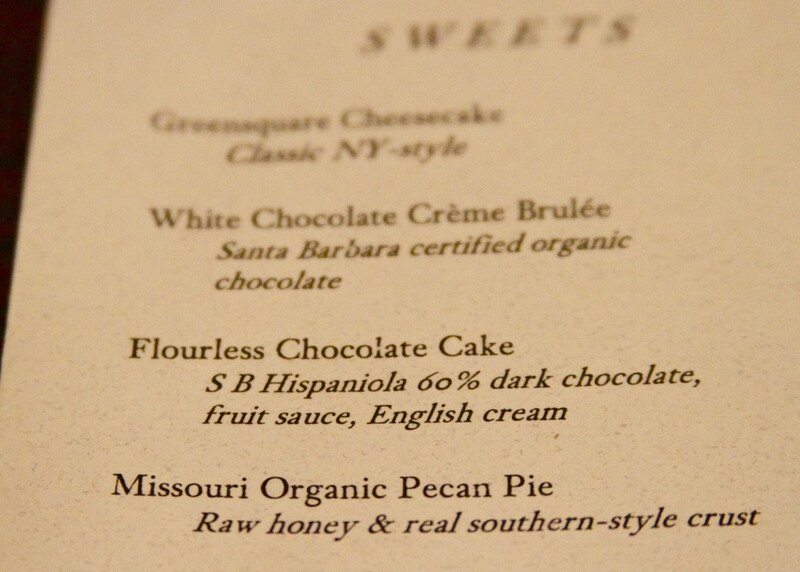 It is not always easy to find a gluten-free dessert so this was another exciting moment. The portion was sized just right and the cake was very rich and creamy. Lea washed it down with a piping hot espresso (no sugar! ), and our lunchtime excursion drew to a close. 1. The produce is locally farmed and/or organic. 2. 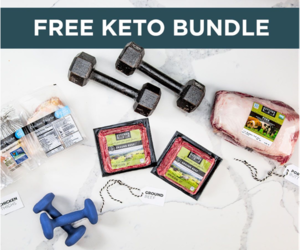 Meat and poultry come from animals raised humanely, antibiotic and hormone-free. 3. Fish are wild caught or ocean-raised, using marine-friendly, sustainable practices. New York City, with its abundance and variety of ethnic foods, gourmet establishments, and bistros remains the restaurant capital of the entire world. Nevertheless, it’s not always easy to find a restaurant serving high-quality, organic and creative meals that also caters to Paleo diners. You can put the Greensquare Tavern into that rare category. The food was excellent, the staff was friendly and well-versed in the needs of Paleo-eating, and the commitment to quality, organic ingredients was evident. 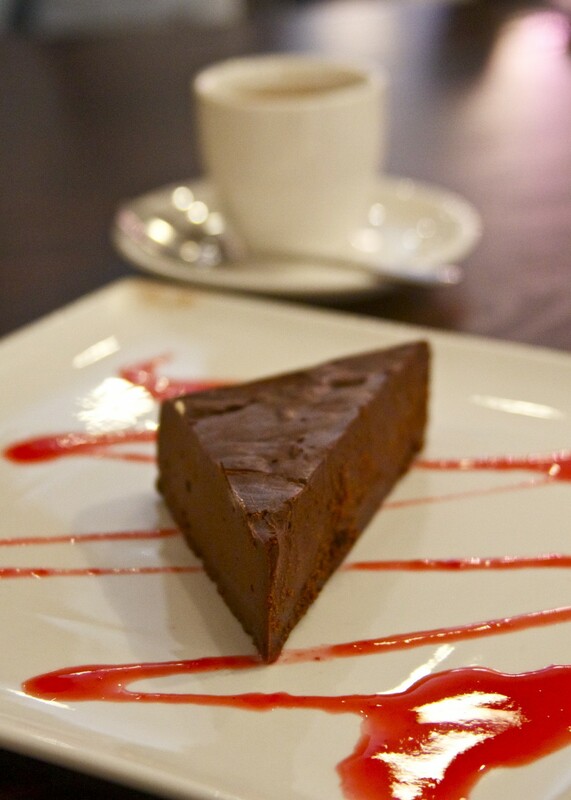 The restaurant caters to many different tastes and dietary requirements. As such, the menu is quite varied and offers something for everyone. 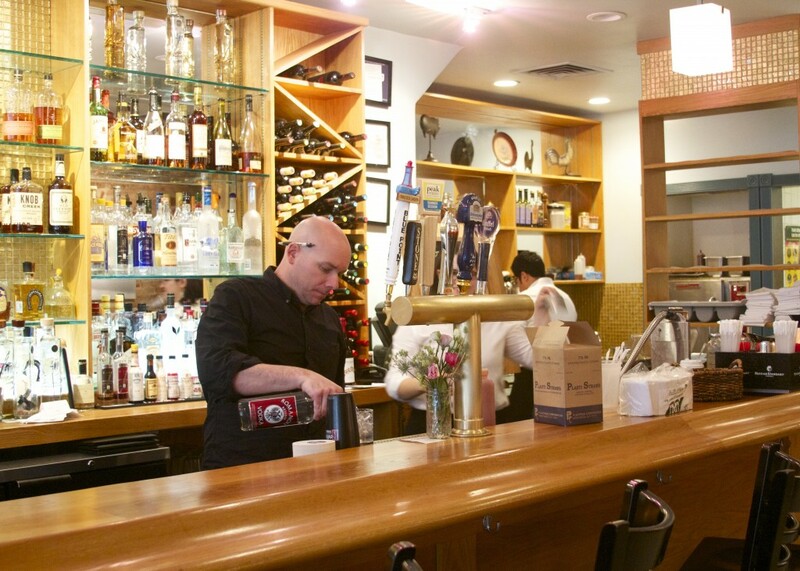 There’s really something for everyone on the breakfast, lunch and dinner menus at Greensquare Tavern. It is also nice to know if you inform the staff of dietary requirements like “gluten-free” or “paleo” or “vegan”, rather than looking at you as if you had two heads, they actually know what you are talking about. Every effort is made to accommodate tastes and requirements which can offer a lot of peace of mind when dealing with allergies, intolerance and/or simple food preferences. 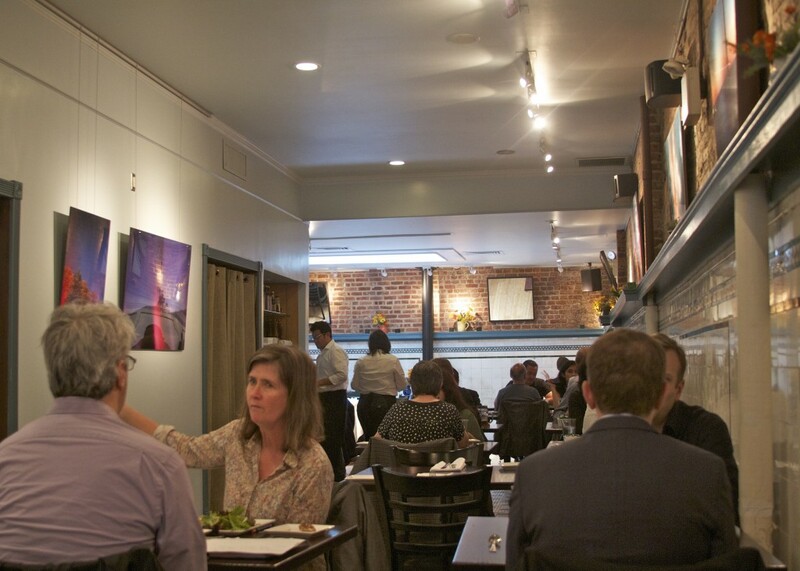 Even if you don’t “eat Paleo,” Greensquare Tavern is a terrific restaurant choice. And if you are Paleo, then consider the Greensquare Tavern a mandatory dining experience in New York City, you will not be disappointed. For more “reviews” and dining experiences check here. One Response to "Paleo and The City: Greensquare Tavern"
Beautiful post, and what a find! 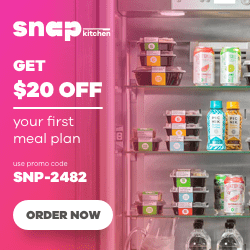 A restaurant cooking paleo. Love it.